Since Final Fantasy III fans of Square’s storied role-playing series have been calling forth primal forces to do their often devastating bidding. Some are more impressive than others. While I appreciate earlier entries in the series for granting fans the power to summon creatures from mythology and beyond to add some extra power to our adventuring parties, this is a list of the best summoning animations. As lovely as many of them are, Final Fantasy summons didn’t go over-the-top nutballs crazy until Final Fantasy VII. Rydia and her Mist Dragon will always hold a special place in my heart. Just not on this list. Why struggle to control godlike powers when you can just slip one some cash? Final Fantasy X’s Yojimbo joins Yuna and friends for a price, and summoning him in battle is going to cost you. A little cash goes a long way, and a lot of cash is downright overpowered. But this is about animations, and Yojimbo’s is pretty much perfect. His hound Daigoro might be overwhelmed with excitement, but the mercenary himself is one cool customer, slipping out from behind a tree in the dead of night. Smooth. An optional boss in Final Fantasy VIII who becomes a Guardian Force upon defeat, Diabolos oozes dark power. At his best he can instantly kill any foe with under 9,999 hit points, and he does so in a supremely satisying manner. It’s all about that ball of darkness, the way it stretches before he casts it down on his enemies. The animation and sound design give the attack a tangible menace. 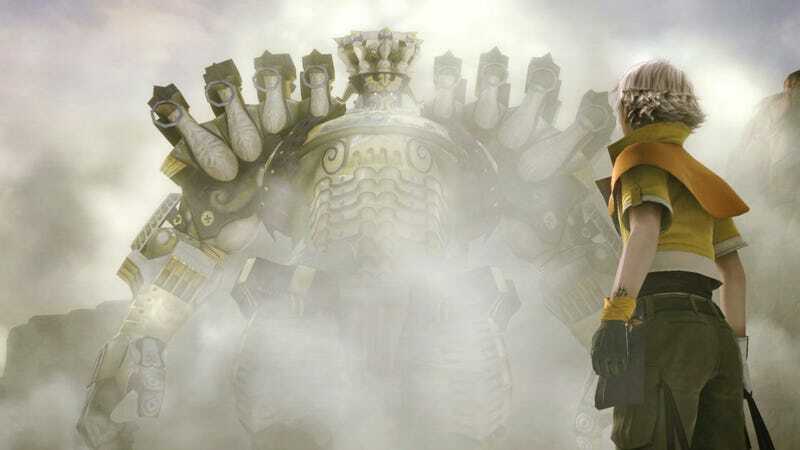 I’m a big fan of things transforming into other things, so of course one of Final Fantasy XIII’s mechanic marvels was going to make the list. I considered Shiva, the two-woman motorcycle team, but upon considering my motives for that consideration I determined they were too similar to my motives for enjoying every Shiva animation. Instead, we have Alexander, Final Fantasy XIII’s Metroplex. His robot form is impressive. His fortress mode is unlike anything I’d seen in a Final Fantasy game. Suddenly there’s a giant armed gate on the battlefield, and boy howdy is it going to hurt. “I will share your pain with you,” Yuna can be heard to say as she summons one of the more tragic creatures in the series (see 5:09 in the video.) Without going too far into spoiler territory for folks who haven’t played, Anima is somebody’s mom. If Anima were my mom, I’d be terrified, even before she dragged me to her underworld and beat the living everything out of me. My least favorite Final Fantasy game (though I still respect its fans) contains one of my most favorite summoning animations. Zodiark’s Final Eclipse attack is a wonder to behold, at least for the short time you have to behold it. Zodiark plunges into the sea and an egg rises, cracking open to reveal a new form. A form that basically tears apart the fabric of reality itself. That seems like a tactic one would save when every other strategy has been spent, but it’s so pretty. Final Fantasy IX’s most impressive summon, Alexander, can’t be performed by the player, but being able to call on a massive transforming airship eidolon makes up for it. The longest summoning animation in Final Fantasy IX, Ark enters the fray as a gigantic vehicle brought to life through the power of belief. Impressive, but wait, there’s more. The airship then transforms into an even more impressive mecha, which then does absolutely horrid things to the bad guys from orbit. I don’t need to justify Doomtrain’s inclusion on this list. Final Fantasy VII liked Bahamut so much they summoned him three times, each of which can be seen in the video above. Bahamut was impressive. Neo Bahamut was even more so. Bahamut ZERO was so amazing it justified having ‘ZERO’ in all caps. I am pretty sure Creed’s “Higher” was about Bahamut’s progression in FFVII. He starts off coming down from the sky. Then he carries the enemy into the clouds. Finally he nukes them from space. The only disappointing thing about this summons is that anything could ever survive it. I know, I know. I was going through all of the numbered games, trying to find this one magnificent Odin summons, but it didn’t seem to be in any of them. Finally I caught a thumbnail on YouTube and did a double-take. My Odin’s in a side story? Yes. Yes he is. Looking back, Crisis Core had some really amazing summoning animations—not sticking to the in-game engine helped. Odin here is by far my favorite, and not just because I already sang/spoke “Poring like an avalance, coming down the mountain” whenever he showed up. If I hadn’t included this one there would have been riots. Incredibly long and drawn-out riots. And Knights of the Round certainly deserves a spot here. Thirteen different knights attacking, each with their own model and weapon, and it just keeps going. Final Fantasy VII was the first game in the series to come out on disc, and Squaresoft did not spare the space. With the latest numbered Final Fantasy game coming out later this year, it’s too early to include any of its summoning animations on this list. From what we’ve seen so far, the massive Ramuh is definitely going to be under consideration for a future update.